Location: In the centre of The Cathedral Green and part of the important group of buildings surrounding it. The Cross is evidently of at least three dates. Medieval, possibly C13 in origin, restored and with the cross-head turned through 90 degrees in 1897 as a part of the Diamond Jubilee celebrations for Queen Victoria. Only the socket stone and the bottom section of the shaft are possibly early medieval, the rest is of uncertain date. 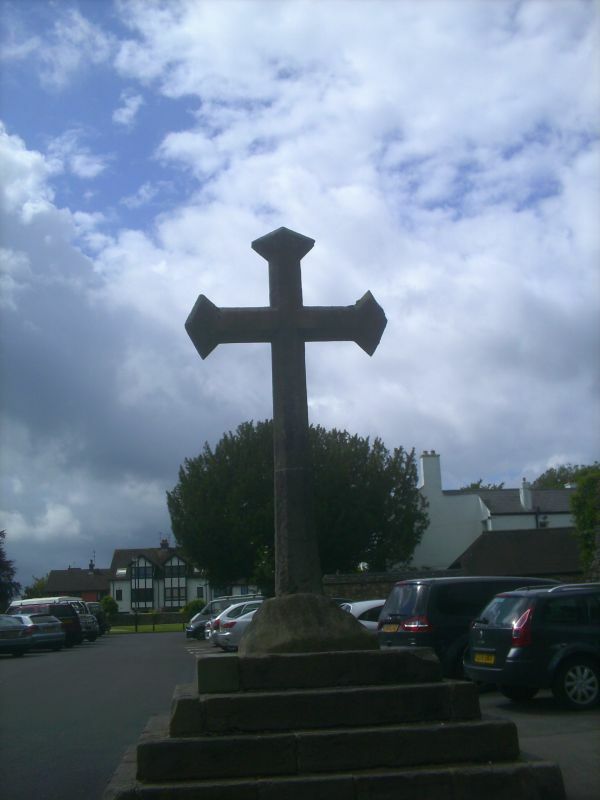 There would be no reason to suppose that it is not the cross indicated on John Speed's plan of 1610 where it is shown in the same position near the stocks and maypole, but with its pre-1897 orientation. This, however, cannot be entirely the case as the Cross is shown without its head in an engraving by H Gastineau in 1830. Preaching crosses are most usually C15 but this seems too clumsy a design for that time and so perhaps the C16 is the most likely date, when the two medieval stones were reused. It was then decapitated at some time, and restored in post 1830 possibly reusing the old head before being restored again and altered in 1897. It is by tradition the scene of the preaching of the Third Crusade by Archbishop Baldwin in 1188 as recorded by Giraldus Cambrensis. Restored cross of stone on four stepped square plinth of stone. Plinth inscribed as follows: ''The City Cross was reset, and the Green partially enclosed at the public cost, by the Llandaff Parish Council, in the year of our Lord 1897, being the sixtieth year of the reign of Her Majesty Queen Victoria. James R Buckley, Chairman.'' Broached socket stone going to an octagonal cross-shaft and a chamfered head. Included as a partly medieval preaching cross with important historic associations and group value with the surrounding listed buildings.